The Attendee Re-assignment add-on is only available as a Pre-release download for Event Espresso 3. Have you ever had an attendee sign up to the wrong event? It can be difficult to get the customer to cancel the registration and re-sign up on the correct event. With the Attendee Re-assignment add-on you can easily move attendees between events. The add-on is available from the Pre Release channel in your account page and installs like any other WordPress plugin. After activation, you will not see any additional settings or menus. To be able to move an attendee, go to Event Overview, find the event the attendee signed up to and click the attendee link for that event. Find the attendee that you want to move from the attendee list and click their name. In the individual attendee record you will see two new options. Move to new event? : If this is not clicked the attendee will not be moved! Available events: This lists all the available events, and highlights the attendees current event. 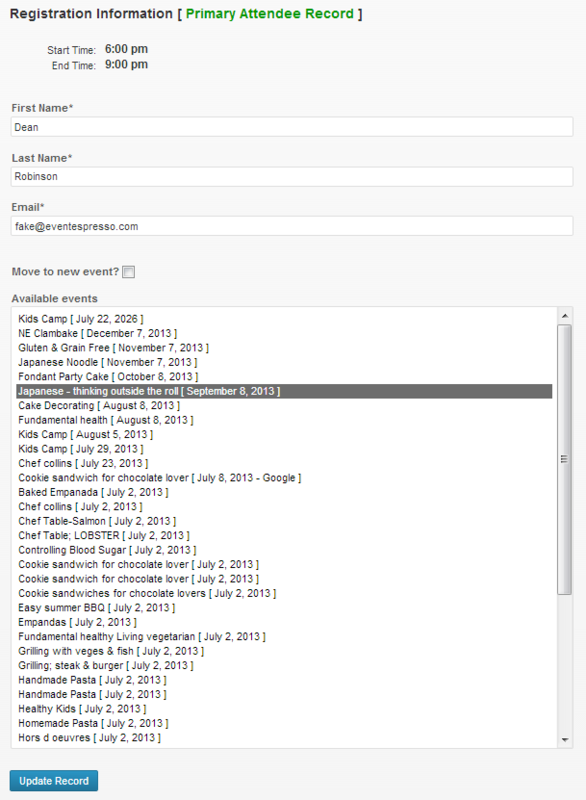 In order to move an attendee, tick the Move to new event checkbox and then select an event from the event list. Once you have selected the correct event, click the Update Record button. An attendee can be moved as many times as you want, however the attendee can only be moved to one event at a time. If you require the attendee to be added to numerous events, they will need to register for each of those events as normal. The Attendee Re-assignment add-on is only available as a Pre-release download.